From School Library Journal: The story of two legendary female kung fu masters who may have lived in the last part of the 17th century. McCully steeped herself in Chinese painting, but develops her own fresh interpretation of classic Chinese art. 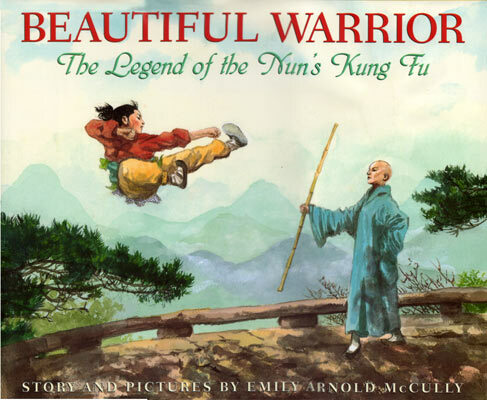 Celebrating discipline and inner strength while retelling legends connected with styles of kung fu, this story authentically re-creates a period of Chinese history and gives readers not one but two lively heroines. From Booklist: Like McCully's Caldecott winner, Mirette on the High Wire (1992), this extends the picture book with a tense drama about brave young women who find strength in themselves. McCully tells a kung fu story about two legendary women in seventeenth-century China. �The pictures reinforce the story of strength that comes from mastering yourself and finding harmony with the universe. From Kirkus Reviews: "A well- wrought story of two 17th-century Chinese women that opens with the birth of a baby girl whose steady gaze inspires her father to name her Jingyong, ``Quiet Courage.'' �Into regular emissions of wisdom McCully blends plenty of humor, some of which is calculated to speak to youngsters, while some is more appealing to an adult sensibility: Look for long and loud applause from those searching for competent heroines in unusual, yet credible, situations.